Residential installation includes the fiber connection to your house from the FairlawnGig network in the street, and installation and configuration of the FairlawnGig ONT (the box that contains the interface to the FairlawnGig fiber network inside your house, similar to the modem you may currently have). Standard installation includes connecting to your house from the most logical exterior location and installing and configuring the FairlawnGig ONT inside your home. Extra indoor wiring and custom configurations are possible for an additional fee. See how the FairlawnGig installation works here. FairlawnGig will waive installation fees for Fairlawn residents. Sign up here for service or call us at 330-668-3300 to schedule your installation! The process includes bringing fiber from the street to your house and indoor installation of the equipment needed for FairlawnGig service. We’ve outlined the residential installation process to help you understand how it will work from this point forward. FairlawnGig’s installation process makes efficient use of our installation and construction crews to expedite your connection. If you are in Fairlawn, schedule installation at your convenience. If you have signed up for service, we will be calling you. However, calling takes time and we often play a lot of telephone tag so call us between 8:00 a.m. and 5:00 p.m. weekdays and we can get you scheduled without waiting for us to call. When we schedule your installation, we will also advise you on a service plan that fits your Internet use. From the time we make contact to schedule your install, you can expect to be enjoying FairlawnGig Internet within approximately two weeks. The next step is to connect the buried fiber from the right-of-way to your house (“the service drop”) before we do your inside installation. After we have scheduled your install, but before your installation date, we will put a box on the exterior of your home near where the fiber will enter. Later, a construction crew will install fiber from the right-of-way to the box on the outside of your home. On the date and time that we scheduled your install, a two person crew will come to complete your installation of the indoor install and service activation. 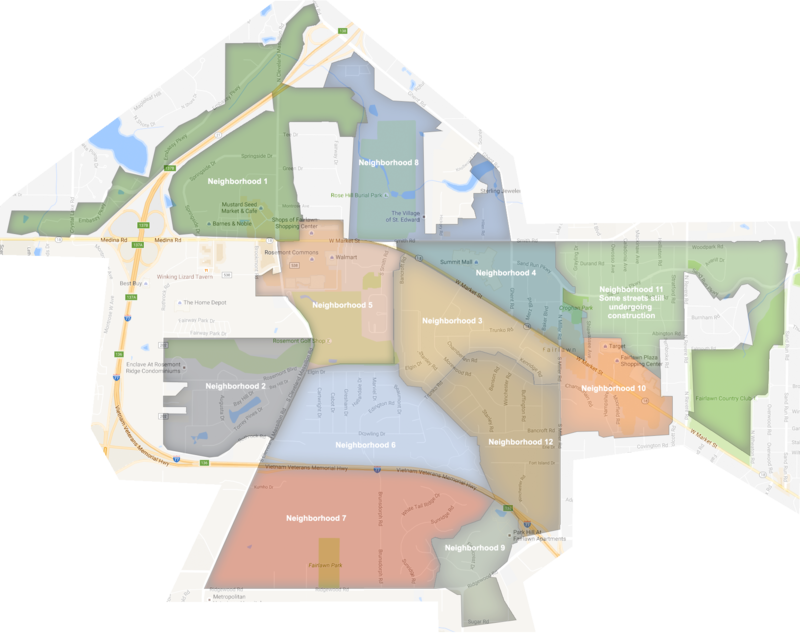 Click the map to see a large version to find your neighborhood.